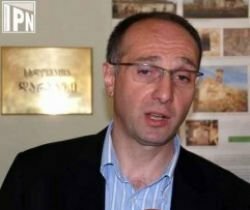 TBILISI, DFWatch — The Prosecutor’s Office in Georgia says public money was spent on campaign rallies for President Mikheil Saakashvili’s National Movement party last September, which is illegal, and that documents were falsified to cover it up. The party held eleven party rallies on the same day and offered free transportation for people who attended. Mikheil Machavariani, ex secretary general of the party, and today a member of parliament, signed contracts with bus drivers about bringing people to Zugdidi in western Georgia. That deal only compensated the drivers, an amount totaling USD 24 000. But then petrol was provided by Levan Kardava, chair of the domestic intelligence service, the Constitutional Security Department, and Nikoloz Dzimtseishvili, Deputy Interior Minister, who was in charge of providing buses with petrol. They gave petrol talons to Alexandre Kobalia, representative of Zugdidi Municipality, and a representative of the National Movement. Talons provided 54 000 litres of petrol paid for by the Ministry of Internal Affairs. Kobalia distributed talons to 393 bus drivers. In order to cover up the expenses, the National Movement falsified documents and wrote that only 93 buses participated, the prosecutor’s statement reads, adding that this type of crime is punishable with from 7 to 11 years in jail. The investigation also revealed that September 23, 2012, Davit Alavidze, Deputy Mayor of Zugdidi, paid USD 73 000 for necessary fees for transport to the town in connection with the rally that day. The expenses were not reflected in the financial declaration, which under Georgian law is a violation; an illegal money donation to a party. The Prosecutor’s Office claims the investigation is not yet finished, but there are more than 100 witnesses in the case, including employees of the transport company, bus drivers and interior ministry employees. Mikheil Machavariani told DF Watch that the Prosecutor’s Office’s information is incorrect and that he never falsified any documents.